Min was very creative in redesigning our website. It was a big step for us to undertake a new website as we had always received good feedback on our old one but felt we needed a more “modern” look and overcome some layout restrictions. She designed a custom layout to suit our needs giving us great flexibility. As I have to make modifications to the website as things in our business develop Min has always been on hand to give me any guidance needed and answer my questions. She is super attentive! It’s great to work with someone so knowledgable and a delight to continue working with her for any future developments. Julia and Steve approached me wanting a revamp of their existing website, which was already built on WordPress. While they were happy with the process of updating it, they weren’t happy with the restrictions imposed on the images that they uploaded, as they felt the photographs taken on their tours were are large selling point for their business. 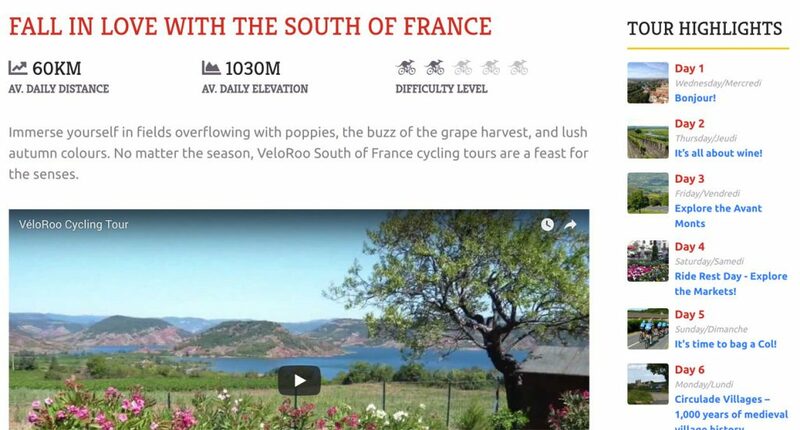 They really liked the work I’ve done on Pterodactyl Helicopters – and being in tourism themselves, wanted something along these lines – that captured the feel of their tours of the South of France in both visuals and wording. As such they asked me not only to redesign their site, but also to edit their content, to bring it in line with search engine optimisation best practises, and also make it sound more evocative to clients. Testimonials are a huge part of any tourism company, including TripAdvisor reviews, so it was also important that we integrated those wherever possible. Steve dropped by one afternoon with a portable hard drive full of photos, and I was blown away by the beauty – I spent several hours pawing through photos scraping my jaw off the floor. Once I saw exactly what they offered, building a design around these phenomenal photographs became a simpler task; in short, use large-scale images wherever and whenever possible to break up the content. Photographs can be integrated in many ways; as featured images, as carousel (scrolling) images, as sidebar image galleries that popup in a larger format when clicked upon, or even just inserted into the text using the standard WordPress insert media tools. Images are automatically optimised using WP Smush to ensure that the load time for users isn’t too great, while not compromising the integrity of the photo. The large-scale photos are often used as background images over segments of title / excerpt text and buttons, so an overlay is automatically added – as well as a square cutout (controlled via the style sheet using a clipping mask, so the client doesn’t have to think about creating it) to draw the eye and focus to the beautiful scenery, and really place the user there, on holiday in the South of France. Branding wise, I took their existing black, white and yellow, and added some more feature and purposeful colours to their brand – colour-picked directly from their tour jerseys (red and blue), with a complimentary green for both interest and user-psychology purposes (green is a welcoming button colour). Development wise, this website is possibly the largest I’ve ever undertaken; there are many custom post types, with many custom fields, all purposefully created to meet the specific needs of Julia and Steve’s business. Tours are brimming with rich content options and a variety of ways to link between content to avoid any duplications. 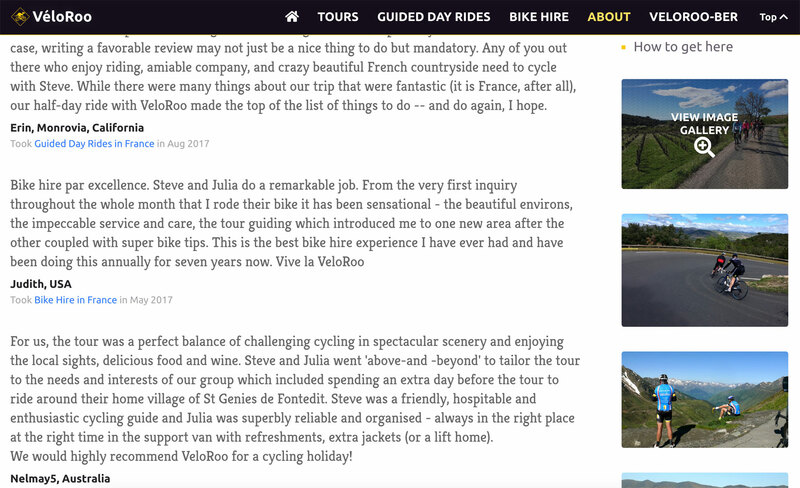 For example, testimonials are created in a custom post type called “Testimonials”, which are then referenced to (with a single click) on any tour or standard page that VeloRoo wishes. Upcoming Tour dates are added, for both their French and Australian tours, on the Tour object itself, and then drawn through in the template to display not only on the Tour page, but the homepage with all of the other Tour dates, and the smaller-formatted Upcoming Tours sidebar, which appears on nearly every page as a quick and easy way for users to click through for more information about any tour. Each tour has the option of linking to an itinerary – another custom post type – which has the ability to add as many days as relevant. Day numbers are automated, and days of the week display in both English and French. Each day can have specific ride data included; elevation, distance, difficulty, etc – and each day can have its own image gallery, to really give clients a sense of what they will experience. For contact and bookings, Julia was happy using their existing JotForms, and so a simple integration was incorporated – either a field for Julia to paste the embed code into to have the form appear on the tour page itself, or the ability to create a standalone page for the form to exist on, which could then be linked to from any other page using either the custom sidebar link (which pulls through gorgeous-looking rich media automatically), or as a custom button using the formatting options in the rich text editor. 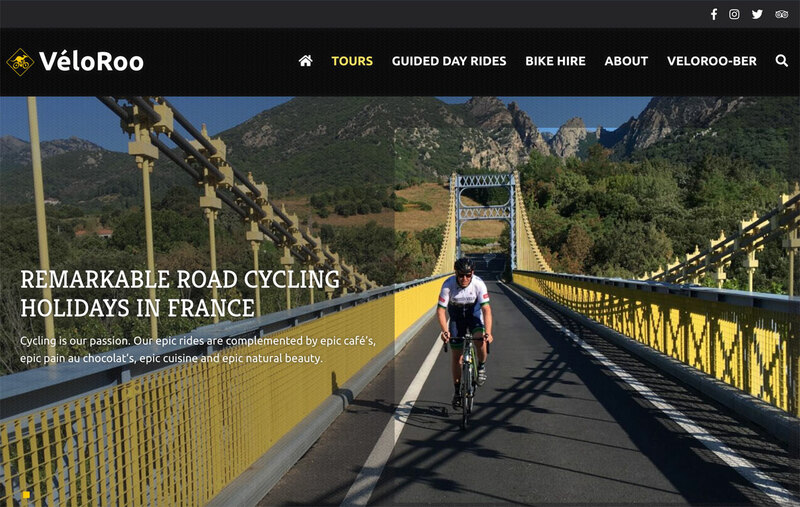 As well as guided tours, VeloRoo offers Bike Hire, and their existing Bike Hire page ranked very well in Google search results. For the redesign we expanded on what they already had, breaking up the text with images and tables and formatting that made it a more engaging read for users, while optimising the key phrases to ensure the Google ranking wasn’t lost on changeover. From a search engine optimisation point of view, after each page was integrated, I consolidated the content and wording to ensure that both user and SEO targets could be met. 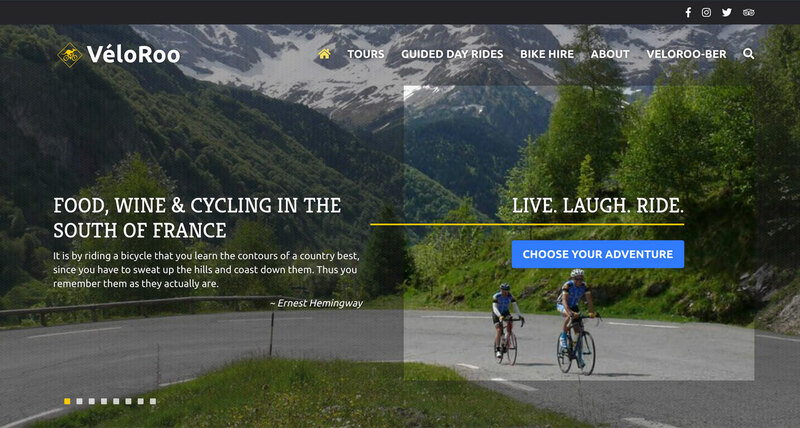 Overall the VeloRoo website is a huge success, from all perspectives. Feedback on the website from both clients and peers have been all positive and it’s a beautiful site to both look at, and work on. 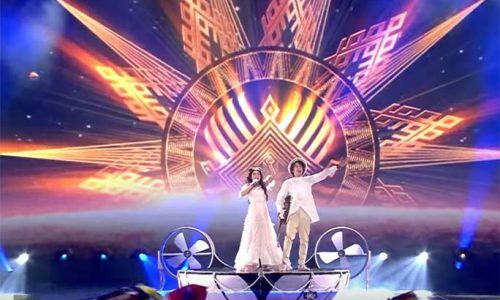 Love Tour de France? 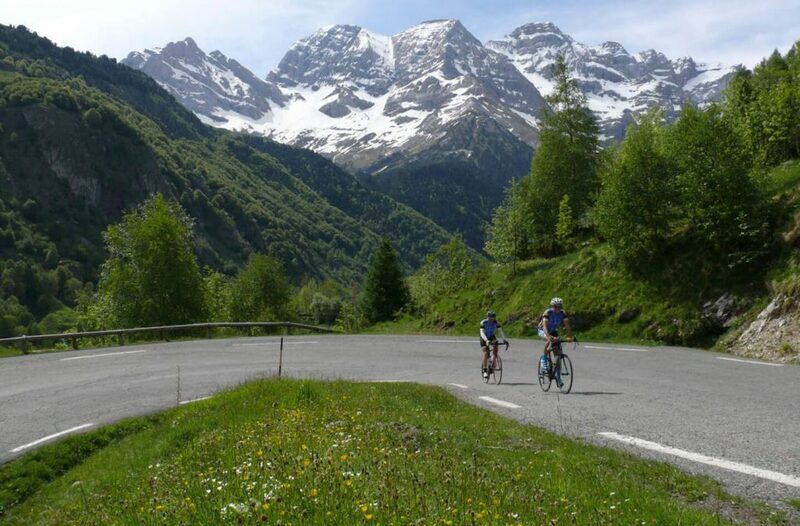 Join VeloRoo for their Tour de France 2019 cycling holiday, for a holiday you'll never forget.